How does your neck age? Get in front of the mirror. Clench your teeth. Tighten your jaw. And have a look under your chin. 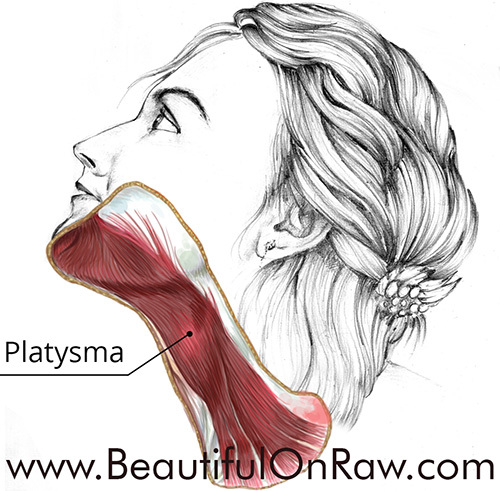 That muscle you see under the skin … your platysma. It's a flat, sheet-like, thin pair of muscles that originates down at the deltoid and pectoral regions and inserts into the mandible and skin of the chin and cheeks. Think: two theatre curtains, closing in the center, covering the whole neck. Unlike other big muscles, the platysma is directly connected to your skin, and completely covers both sides of your neck when you’re young. As we age, the platysma thins. Aging will also cause the platysma to sag and weaken. Weakness and laxity cause our two-part theatre curtain to open and separate, and the fat behind it to spill out. There it is: turkey neck. The curtains’ edges begin to roll up, too, forming what’s often quite illustratively called the platysmal cords, running down both sides of the neck to the deltoids. Your first option ... You can be treated with series of superficial intradermal neurotoxin injections directly into the contracted platysma. A series, that is, of about 8 to 12 injections. Between two and three weeks later, you will see some improvement. Possible adverse effects: discoloration of the skin, difficulty swallowing, neck weakness, or an asymmetric smile. The look of your neck will improve. But it will last until your body sheds the toxins from your system. The risk is significant. Keep in mind that platysma has a lot of nerves, similar to tongue and eye muscles. Any damage of it can lead to paralysis of some areas and distorted facial expressions. What about cosmetic surgery? We’re talking here a “neck lift.” The platysma is divided and tightened, creating a sort of “sling” which lifts the soft tissues under the jawline. Such surgery creates a certain tightness in the neck—a tightness which will eventually go away. Or not. Sometimes, portions of the platysma need to be removed entirely, which can result in deformation of natural contours. Be careful. Post-op pictures can look deceivingly good. If taken soon after surgery, there will often be some swelling present, creating the illusion of a plump, youthful neck. The look is a decidedly temporary effect. Whatever need there may be for surgery or for neurotoxin procedures, these deal only with effect — not cause. What can you do to achieve a natural neck lift without surgical intervention? Why do the curtains of the platysma separate? Answer: They’ve become flaccid, worn out. Patch it, and in a year there’ll be another weak spot. Analogy … Have you ever mended an old sock? You find a hole. Stitch it. But the sock’s getting thin. When you stitch in one place, put the sock on, and ... rrrriiip! It’s torn in another place. You apply a bigger, stronger patch, perhaps. But then that stronger patch pulls harder on thinner material around it, and … still more tears! 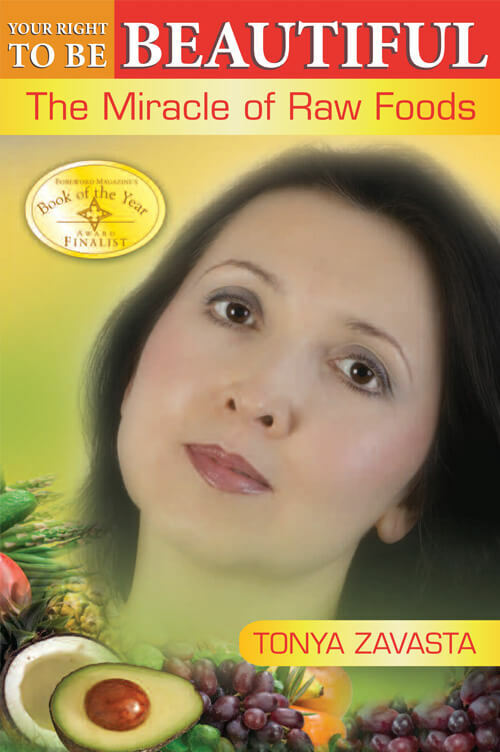 I suggest you deal with the entire process of aging, and keep your platysma muscle as youthful as possible. Good news ... You can get a neck lift naturally, a neck lift without surgery. Nourish from inside and outside ... Stimulate with stretching exercises and massage ... Moisturize. 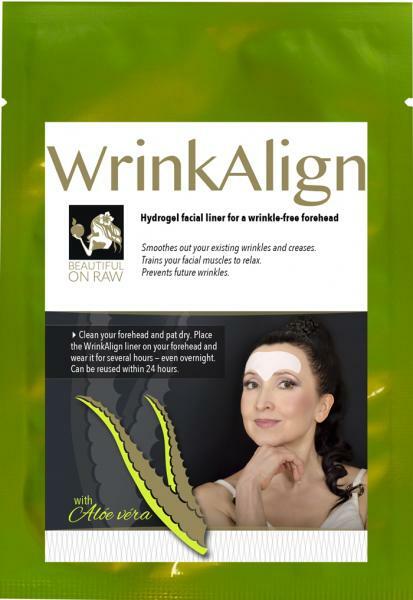 For more Solutions to Aging Neck look here. Cover your neck lavishly with your favorite oil and oily night cream. Use the four fingers of your right hand begin to stroke down the left side of your neck’s front for a few seconds. Do the same with your left hand on the right side of your neck. Be gentle — avoid direct pressure on your windpipe! That’s it! Perform this massage daily, and you’ll see results in two to three weeks. It’s good for your face, even better for your neck. One reason has to do with the human body’s lymph system. Gentle dry brushing—stroking from the chin down—will stimulate the underlying tissues and muscles of the throat and neck. This leads, most critically, to increased blood flow. The result: firm, rejuvenated skin across your neck area. You can dry brush every part of your neck. Tip: On the front, go super-light. Then apply night cream lavishly. Keep it up for a few weeks, and you will see and feel a difference. Whatever you do for your face, do for your neck as well. 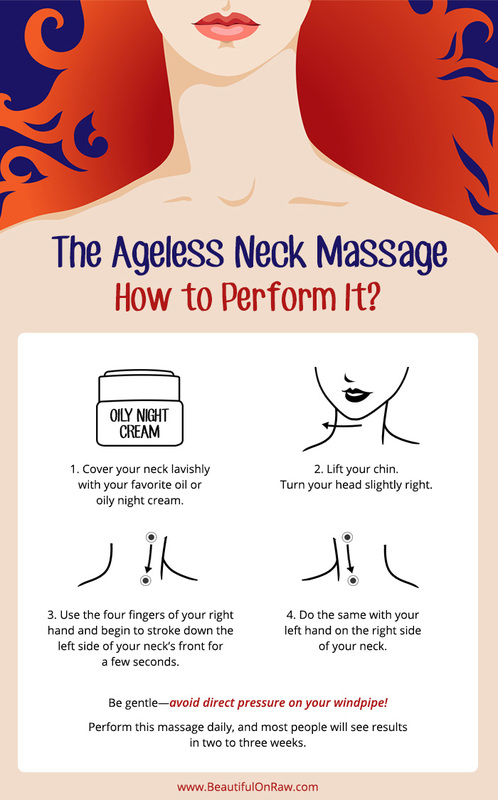 Your neck is the hardest area to keep ageless. It must be exfoliated, stimulated, and nourished, just like your face. You dry brush your face, so dry brush your neck. You moisturize your face, so apply cream lavishly on your neck and decollete. Now, you need also to give your neck some stimulation. Our RejuvaRoll works very well for that purpose. Again, not a miracle product—nothing is. But RejuvaRoll will do the job if you use it daily.